Sign ups are continuing to come in for this years Where Bloggers Create party!! Yeah! It's going to be so much fun!! I thought I would give you all a sneak peak of one of the changes to my studio this year. I decided to add just a little bit more color to the room. I made a new door pocket organizer for myself. It's a lot more girly and has a lot more detail than the one I had there before. (If you want to see it click here) But I still used that wonderful smooth burlap fabric, cause I just love it!!! 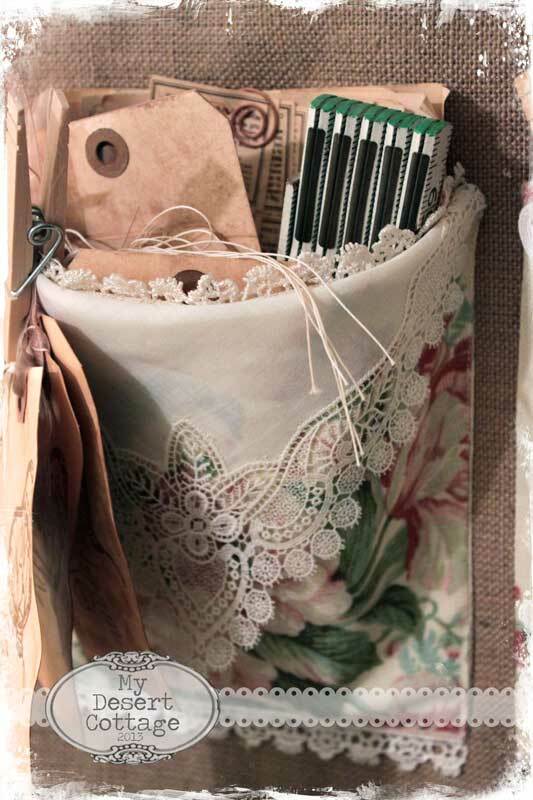 Each pocket has a doily and a little bit of lace trim. I cut the doilies in half so, each one did two pockets. in a few weeks. If you are participating in the party, please don't forget to put the button on your sidebar so others can join in too!!! Too too cute! I love your pocket organizer and am working on making my creative space party worthy. Skønne, skønne hængelommer, du og din symaskine er utrolige kreative. knus morkaren. I hope that's on the outside of a door..too pretty to be hidden.. It looks great, Karen! I love it and wish I had room for something like this. I have been getting ready for the party though. : ) I organized my fabric the other day and put some on the side to donate. The old one was cute but, I LOVE the new one! I know this years event will be smashing as always my friend! Beautiful Karen! I just LOVE it and can totally relate to the "just nice to look at" treasures... that would fit right in in my studio too! You took something pretty funcitonal and unattractive and turned it into something beautiful! Ohhhh it cute-- so so cute!! It's you girlfriend-- and of course we all love it! Your photos are killer! I'm looking forward to the party-/ it's my yearly excuse to clean up this room!! Gave your party a little shout out on my new post tonight-- it's going to be great fun! 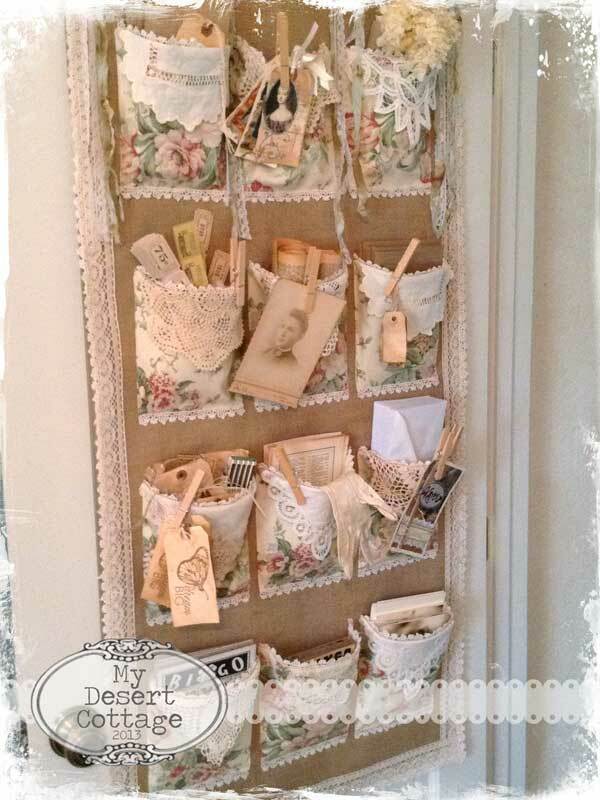 Love your pocket door organizer..great idea! Wasn't sure if I would play along this year since my office hasn't really changed much since last year and don't know if people want to see the same thing. I had hoped to have my potting shed closer to being done and i could have shared that since gardening is creating...right? Let me know what you think. I do have a new crystal chandelier hanging by my desk and could chage up a few things...add flowers, etc. Oh that's very pretty....and useful as well. That's the power of handmade.....the ones you can buy I always quiet Ugly. Your organizer looks amazing ! I love the lace and doilies you have stitched on to the burlap. the contrast looks great ! Love seeing utilitarian items turned into scrumptiousness! Very pretty Karen, I'm gonna have to come over again just to see all the neat things you've done since the last time I was there. Let me know if you ever wanna get together for some shopping. Oh, what a great idea, and it's SO beautiful... thank you so much for the inspiration - definitely putting this on the list! I have stuff sitting in random boxes and on random shelves... time to get - beautifully - organised. Oh my goodness, this is soooo gorgeous it makes my heart sing!!!! I think I need to do one for my room, but maybe a little smaller, I'll have to scope out an area for it!!! I'm just swooning over your blog and am so happy to have found it!!! Still trying to decide if I should join in on the blog hop or not, I just did a post on my room, but probably should take some better pictures!!! I love it! Thank you for sharing your creativity with us. Have a great day. I have been working, sorting, purging and painting....getting ready for this years party. I love your organizer ! Your work is rubbing off on me....I find myself being drawn to vintage shops every weekend. Oh, your pocket organizer is so beautiful. Love all the sweet details you've added. Oh my god. This lovely piece of art is just stunning. It presents so vintagy. I better grab a sewing machine from my mum and learn how to sewn. I love the organizer! 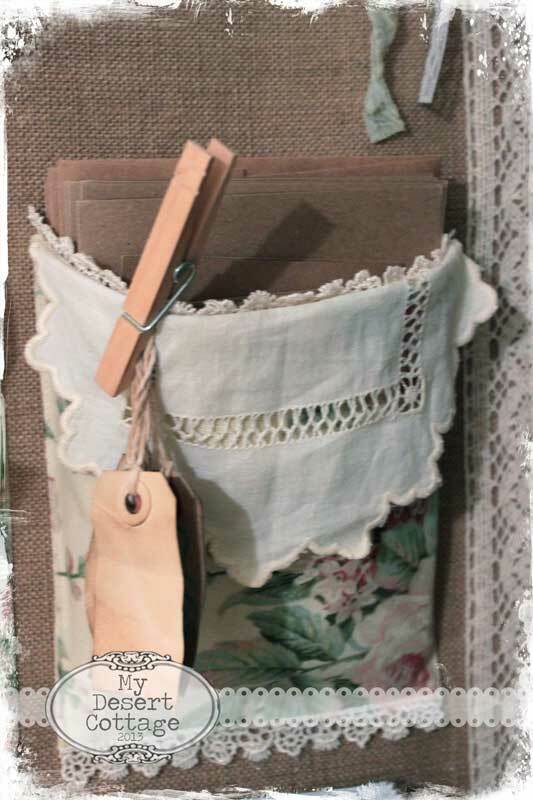 It reminds me of the vintage shoe bag that hangs like that, that I purchased about 10 years ago! I need to find that! 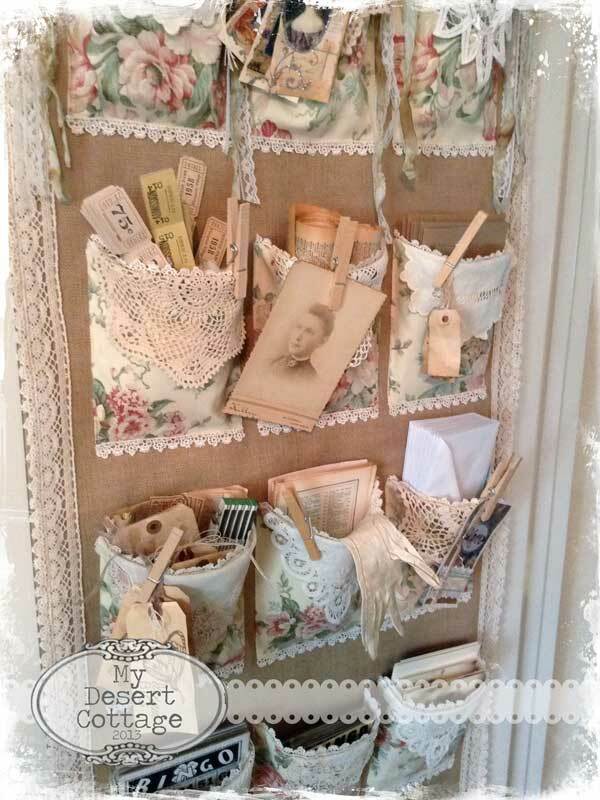 what a great idea...I have so much to do in my design room, I didn't ever put it uop because it was a busy summer and I have since added cabinets and such. Now I have to figure out whre to put it!....Oh, I have an idea! LOL Maybe next year I will be able to share my design room....when it's organized! Hi Karen, just wondering if you can use my last posted studio for this party. Do you have it still on your computer? I probably won't be ready. 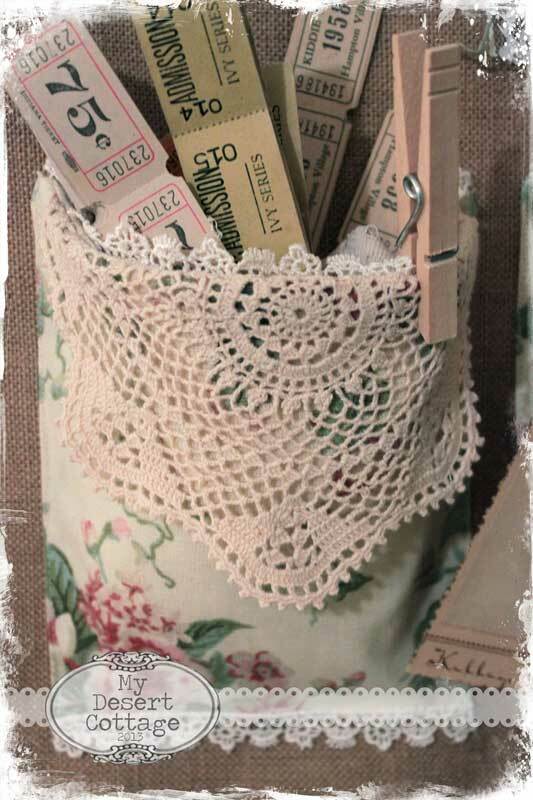 The door organizer is very pretty a lovely addition to you room .The lace and doilies make it so pretty. Love the paper goodies from the pockets. I absolutely LOVE your style! You rock! I am a fellow Sweet Salvage stalker too. Such a fun place! !